We love hosting our Farm-To-Table Dinners and want to thank all who have participated. We hope to see you soon... and remember to make your reservations early! 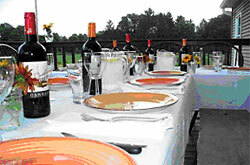 Come to our exclusive 25 guest Farm-To-Table Dinner. Our farm is a five minute drive from the Main Street of New Paltz New York. The farm overlooks the Shawangunk Mountain Ridge, home of Mohonk Mountain House and the tower. Pete, the farmer and I love to cook. Everything served comes directly from our organic farm or is sourced from a local Hudson Valley Farm. It is an experience that adds to the deep appreciation that so many people have for our farm and for all who farm and produce local food. It will also help support the continuation of Taliaferro farms. Should you want to stay, go to Airbnb. There are many awesome places to stay at right here on or near Plains Road. Menu and description to come. Seats go fast for our dinners, so sign-up early. Reservations are limited to 25 people.